This is a valentine we’ve been making at my workshops recently and it fit the bill for the SUO Challenge this week! Card Recipe: Pool Party and Very Vanilla card stock, More Amore DSP (this includes the printed paper AND the laser cut heart), Red Glimmer Paper, Full Heart and Small Heart punches, Bloomin’ Marvelous Sale-a-Bration stamp set, Soft Suede and Pool Party Ink, stampin’ sponge, Dimensionals. Love the way you incorporated both the DSP element and the die cut from the More Amore Specialty DSP. The Pool Party is such a nice non-traditional background color, too. Thanks for sharing it with us at SUO Challenges! 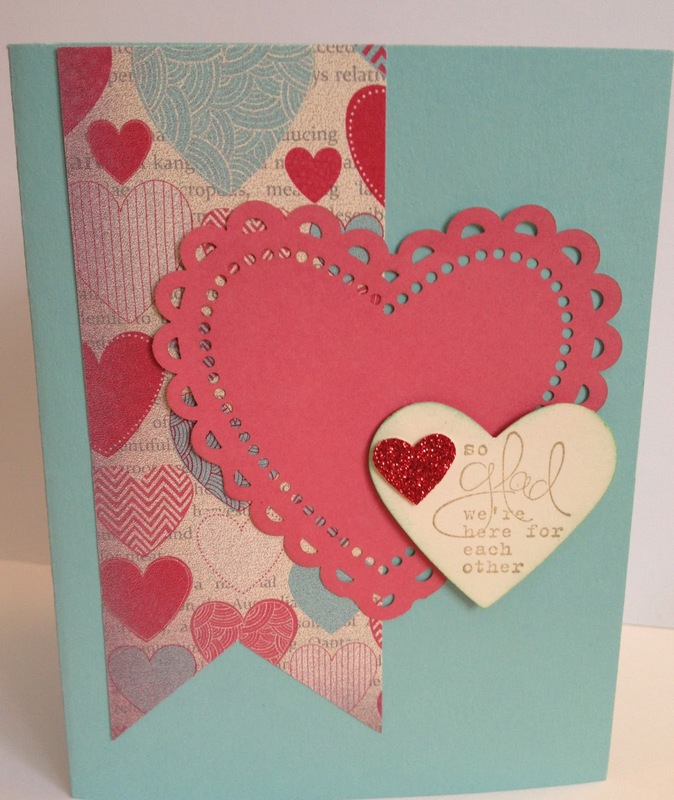 This paper and layered hearts always look perfect together! Thanks for joining SUO Challenges this week. Oh, that SAB greeting is perfect for Valentines…and love those doily hearts! Thanks for playing along with the SUO Challenge this time! So very beautiful!! Love it!